Long term backpacking often comes with a strict budget and I am no exception. This means scrimping for many months, doing without and cutting expenses where you can. With today's rising cost of air travel, a round trip ticket will take a large percentage out of every traveler's coffers. Finding the cheapest airfare to your destination is one of the most confusing and frustrating processes that a traveler will go through prior to his/her trip. I take the view that spending a dozen hours researching insider strategies, and trying to apply every trick in the book only to shave off an additional $100, isn't worth my time. However, there is one factor that will make a huge difference in the price of your airfare, and this is when you buy your ticket. Airfares bounce up and down without warning or reason, so it's important to have a read on average prices before you buy. This starts long before you plan to take your trip. Sites like Kayak and Bing Travel Search are a traveler's best friends. Not only will they search multiple travel sites like Expedia and Orbitz, but they will monitor prices for you and send you emails at regular intervals to keep you updated. When I first started planning around a year ago, prices for a round trip from Winnipeg to Singapore were around the $1,250 dollar mark. Expensive to be sure, but at the time, I had no idea of average prices for the trip, and didn't buy at that time. When I returned to my airfare search this past summer, prices had risen substantially to around $1400. This is when I set up weekly fare alerts with both Kayak and Bing. Over recent months, much to my wallet's dismay, prices continued to rise. That $1,500 ticket was equal to about two months of daily budget in Asia. Staving off my own fears that the price would continue to rise I held out until recently when my inbox revealed a substantial $411 drop in price. As I tweaked my search dates slightly, I was able to find an extremely cheap price of $1,173 (taxes included). I jumped at the opportunity and bought the tickets through Orbitz via Kayak. Sweetening the deal was the fact that the airlines I would be flying with had changed. Up until recently the most inexpensive airlines had been Northwest or Cathay Pacific. Having heard less than stellar reviews of Northwest, I was thrilled to find I would be flying with Air Canada and Singapore Airlines. There isn't a prize for being uncomfortable. Most importantly, by flying with Air Canada, I am assured a back-of-the-seat entertainment system which is worth its weight in gold when you're in the air for around 50 hours. Singapore Airlines is also consistently ranked among the best in the world. There were several ways I could have dropped my fare a little further. Because I was directed to Orbitz from Kayak, a portion of my fare was paid to Kayak as a finder's fee. I may have been able to save a small amount by going directly through the Orbitz website. However, I have no problem supporting a relatively new startup, without which I would have certainly wasted many hours and eventually paid more for my tickets. Because budget airline profit margins are so slim, many do not offer a referral fee to a search service like Kayak, and therefore are not included in Kayak's search. I may have been able to save some money by amending my destination to Hong Kong (my flight's connection) and searching with a regional budget carrier like Air Asia. Ultimately, convenience and a flight with Singapore Airlines kept me from trying this strategy. If you are a traveler that is concerned with your impact on the world, you can give something back when you buy your airfare. If the cheapest option is through either Priceline or Travelocity, you can support an excellent charity called Hands on Disaster Response (HODR). HODR is often one of the first reconstruction charities into the sites of natural disasters in the US, and all around the World. They take volunteers and provide room and board for them as they work to help locals rebuild. I've been following HODR for some time, and have been eagerly awaiting a time that I can volunteer with them. Much like Kayak, if you search and buy through the Priceline or Travelocity search modules on their flights page, HODR will receive a small amount of compensation that will be put towards a good cause. Be sure to remember them when you book your next trip. No matter how much prep I do for a trip, it only becomes real to me after I buy my tickets. Now I have a countdown in my head, and the clock is ticking. HODR: yes, by all means, do volunteer with them. They have a great project right now in Sumatra until end February. It's the best way to learn about a country while helping folks at the same time. I fully intend to, funding, availability and a disaster all have to come together, but one day. I've been following the Sumatra project closely and would have gone if the airfare and a month off wouldn't have negated my ability to go to SEA in Apr. I know that sounds selfish but I'll make a contribution with them at some point. I used to book for a company booking international tickets for employees. The old rule of thumb of buy it as soon as you can doesn't really apply much and waiting till the last minute to scoop up a deal isn't that great either. I found that the cheapest tickets you'll get for a flight (this is only my observation from 3 years of doing this) is between 2-3 weeks of departure. It's a tricky game to play as I have seen tickets go from $1k to $2k in a day, so be careful. Great post Matt and your advise is sound and true. Using a service that can email you updates is the best bet with minimal effort. I won't lie though, Expedia does a pretty good job on finding some of the cheapest flights and on average I find them to be better then Kayak overall (esp if your departing from the US). Both sites are great though and should be exploited, as each have different angles to their service. Best one is Momondo. they always have the lowest fare make sure you use them. 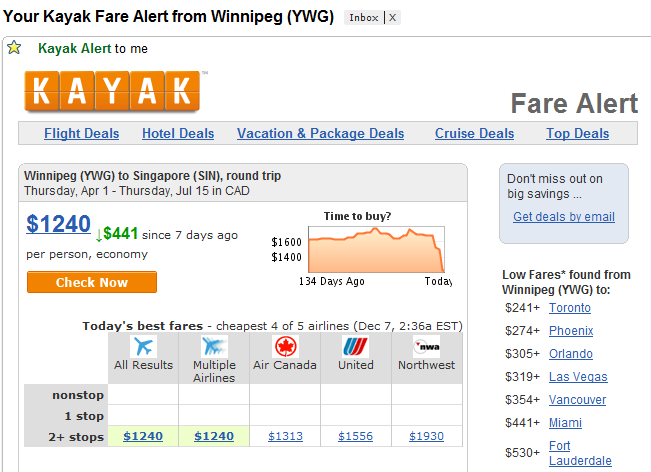 hmmm, I just did identical searches on Kayak and Momondo, Winnipeg to Singapore April 9th to August 9th. That's a $229 difference, what I didn't mention is that I checked other sites like Bing, Vayama and Cheapoair, but I only focused on what worked for me in the article. My mother was right, always pays to shop around.